Rivermead is a contemporary range of furniture, crafted from A-grade solid oak with sleek modern lines, panelling and brushed metal bar handles. 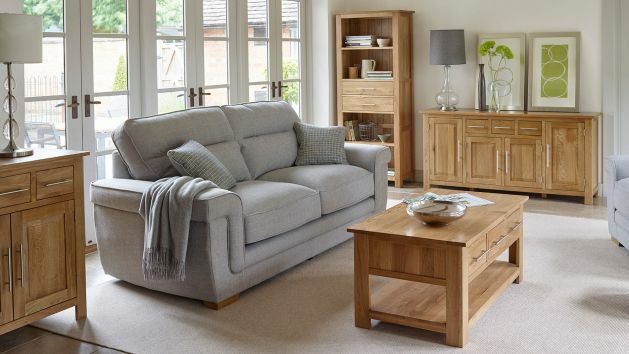 The Rivermead Natural Solid Oak collection is one of our most popular contemporary ranges of furniture crafted from the finest solid oak timbers. It's designed with sleek modern lines, smart panelling and brushed metal bar handles. Each piece is crafted using premium grade solid oak with dovetail joints in every drawer. Dovetail joints are traditionally used, highly durable joints that ensure that the drawer will stand up to constant use over the years. The range includes items for every room in the home; from luxurious beds, bedside cabinets and stately wardrobes to oak dining tables, sideboards, glazed dressers and storage units. Rivermead also includes bespoke units to accommodate specific items such as the television, HiFi and CD collection. These units feature glazed cupboard doors as a part of the design, perfect for protecting your favourite ornaments or glasses.